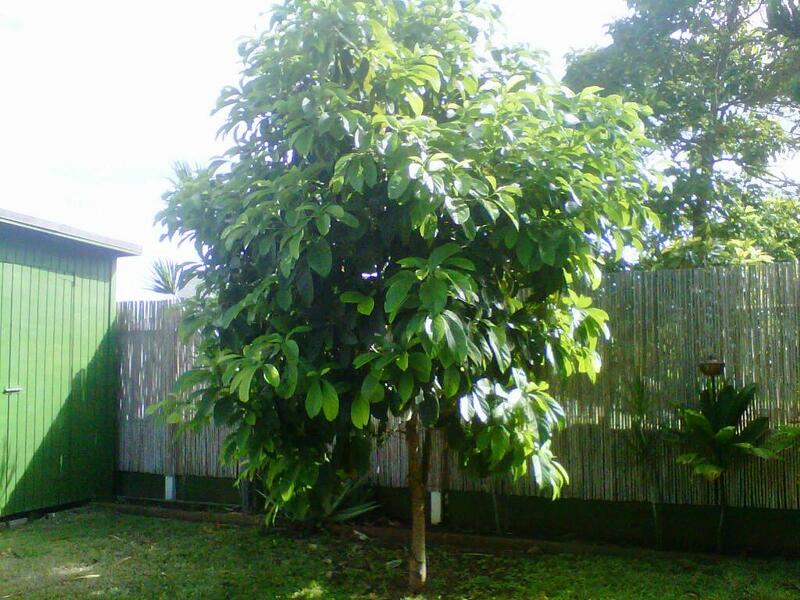 There’s one in there somewhere: an avocado tree provides its fruit with perfect camouflage. Mangoes all over the ground as I walk the roads near our house. But the tree in our garden? Finished. Harvest has been and gone at Chateau Morvan. The trouble with mango trees is you get all you’re going to get all at once. So one day you’ve got buckets of them under water to try to keep them until you fancy one again and the next day the tree is bare. We had so many that when the guy came to fix the phone line and asked if he could have one for his daughter I gave him a shopping bag full. The issue now, though, is avocados. Or rather one avocado. The only one left on the tree. It’s half a mile in the air and so well camouflaged that every time I look it takes a minute to locate it. But today is the day and I have plans for it: plans involving Worcestershire sauce and a knife and fork. Cut it in half, mash it up and splash some of the spicy brown nectar on it. It’s the easiest starter in the world, but the kind of thing that impresses people if they’ve never come across it before. They’re funny things, avocados. Rock hard for most of their life, perfect for about two days and then garbage. Of course I could go to the shop and get one, but when you’ve got a tree right outside the house, spending money that way seems wrong. So there it hangs, dark green and seductive (and there aren’t many things you can say that about). In the house we had when we first arrived in Tobago there was a pool in the back yard. An added bonus about that was that swimming pools tend to come with a long-handled net for sweeping leaves out. And if you angle them up instead of down, you’ve got a perfect avocado grabber. Wave the swaying pole in the right direction until it pops under the fruit, give a sharp tug and you’ve got half a meal right there. The house with the pool is way in the past, though, and therefore avocado retrieving devices have to be improvised. What we have here is a long aluminium strip with an l-shapedprofile, as if it were for protecting the edge of an interior wall. Maybe that is what it was made for, but in its retirement it has languished, unloved, in our back yard, covered with dirty sand. Now, though, in its twilight years it has been given a chance to be useful again. With a wire coathanger attached to one end like a noose, it is a humble masterpiece of homemade avocado-picking technology. The trouble is, the object of my hunger is a long way up and even my flimsy metal friend can’t reach it. Where is my 13-year-old tree-climbing son when I need him? Now 22 and living in Barcelona, as a matter of fact. Which leaves his old man to perch precariously on a bar stool and fish in the sky, more in hope than expectation. My wife, the reviver of a plan which I had already considered and rejected, has the vital job of holding the stool while I risk my neck. Aren’t women supposed to be the cautious ones? It has to be done. You can’t live in such a bountiful place and be deterred by such a piddling obstacle as height. Madam seems to think it will be a doddle: thrust the device skywards at an angle of perhaps 70 degrees and it will garotte its target like an 18th century brigand who’s just swum ashore with a dagger between his teeth. My superior grasp of the situation includes the words “no” and “chance”, which doesn’t go down well. So, while she abandons her stabilizing role in favour of getting a good look from a distance and offering left-right-up-down advice, I poke the tool with as much accuracy as randomness will allow and the coathanger snags a branch. My adviser is excited and urges me to shake it. I shake. Leaves flutter and suddenly a pear-shaped heavy object loses its grip on the branch and plummets to the ground. It’s undamaged and hard, but nothing a couple of days wrapped in newspaper won’t cure. Or buried in flour, or whatever old wives’ tale you favour. This is the life. Free food, and nobody was hurt during the capture. Maybe I should borrow somebody’s pool-cleaning net and sit on a rock at Bacolet, dipping it into the sea and returning with some magnificent, nutritious and free fish for the main course. There’s a worldwide boom in avocado prices and a gang in California was recently busted for a $300,000 avocado heist, but hey, we’ve got a tree that produces them for nothing. Pity it seems to be closed for the season, that’s all. Previous Previous post: The English Pedant – What did you call me?